Now this is something that any Filipino to be proud of. One of the team in charge for the latest Pixar’s Animation “ WALL-E ” WALL•E (short for Waste Allocation Load Lifter Earth-Class) is a Filipino. His name is Nelson Bohol a Production artist , and the only Filipino member of the design team, contributed his artistry in completing the fantasy animation’s over-all look. 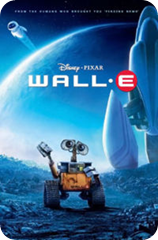 The movie follows the story of a robot named WALL-E who is designed to clean up a polluted Earth. He eventually falls in love with another robot named EVE, and follows her into outer space on an adventure. WALL-E is the latest among Bohol’s projects which included animated films "Ratatouille" (2007), "Cars" (2006), "The Incredibles" (2004) and "Finding Nemo" (2003). Bohol also worked as a lay -ut artist for the movies "Titan A.E." (2000) and "Anastasia" (1997). It is good if this news is true but by researching there is also some another name claiming for this great achievement. Who is Chris Chua whom was reported by Daily Inquirer that is also part of this movie ? Anybody could tell me if it is Nelson Bohol ? or Chris Chua ? I’m confused 🙂 but One thing for sure there are Filipino Artist in that movie which I am proud of even their name is not written in the net as shown here, I just hope that this is true and not a hoax and someday they will be one of the front liners for this kind of Animation. UUy bago yung ginagamit mong name ah.. kala ko kung sino nung check ko yung website ikaw pala entreprenars 🙂 Ano ba pangalan mo James ?